It is very true, but hopefully by and reading our Texas Holdem Strategy section you will at least have a clue how to do well at one of them! One of the great benefits of poker is that it is quite easy to learn the basics. The rules are quite simple and allow easy access for beginners. However, on the other hand, it is a tough game to master; there’s always something to improve upon or learn. The basic strategy below should provide you with the groundwork for developing a dominant poker game. We link to some more advanced material throughout for anyone that is further ahead of the trend. Thank you for the support. Get your Poker 101 Guide here. Your preflop poker strategy forms the foundation of your game. Your first decisions will be made preflop during a hand, so it is important to get these decisions right. Thankfully this is one of the easier areas of the game to understand. We have JTs (J = Jack, T = Ten and the ‘s’ after JT means both cards are of the same suit. An ‘o’ after the JT would refer to off-suit) in the first position under the gun (UTG) on a six-handed table with $1/$0.5 BB and SB. We have to decide what to do: we can raise, call (otherwise known as a limp) or fold. There are a huge number of factors which we need to take into account, and unfortunately, I won’t be able to cover them all. But I will try to cover the most fundamental factors in the coming paragraphs. Firstly, it is very common to see new players play too many hands. They believe that they can outplay their opponents post flop and turn a profit even with the weakest hands. This belief isn’t the case and often is the main reasons a new player loses money when starting out. Thus the first preflop poker strategy tip is to play only a small percentage of the hands you are dealt – the type of hands to play will be discussed further on in the text. Players who play a small selection of the hand they are dealt are referred to as tight. Conversely, players who play lots of hands are known as loose. Preflop poker strategy Tip 1: Only play a small percentage of the hands you are dealt. Luckily, JTs is in the top 12% of hands and therefore is a hand we would want to continue with in this case. We can determine ‘how strong’ a hand is using a program called Equilab. So our options are now to raise or to call because our hand is too strong to fold. Limping is defined as calling the big blind instead of raising or folding. For example, you are first to act after you have been dealt two aces (AA) or like our example with JTs and instead of raising, you just call – this is called a limp. You give the other players a chance to beat you with their weak holdings. For example, if you limp with AA and your opponent in the big blind checks behind he will have a chance to outdraw you to three of a kind or two-pair. Do not give people a free chance to improve and beat your strong hands. Raising with good hands builds the pot. A big hand deserves a big pot! Typically the only way you will win an opponent’s whole stack (all of their chips) is by raising preflop; winning their entire stack is what you want when you have AA or KK, right? It allows you to better understand what your opponent may have. If we limp in and our opponent is in the big blind, he could have every possible hand; however, when we raise our opponent will fold some of the worse hands and the type of hands he can have become more defined. Experienced players use this to their advantage. Playing speculative hands (hands which could potentially, but infrequently win a big pot) such as 64s (s = suited, o = offsuit) and T2s just is not profitable in the majority of cases, whether you raise or limp, and no matter how good you are at poker. Since limping (i.e. just calling) is not an option our only option is to raise. That poses the question of how much? In this case, we will raise to 3x the BB, so $3 and one player calls our bet as shown. We will cover the reason we use 3x later in the article. You should only raise or fold your hands when first entering the pot. However calling with some hands after someone else has raised is fine. There are some situations where open limping is a good idea but they are so few and far between that never limping is a good starting preflop poker strategy – especially for a beginner. In poker, an aggressive opponent is a player who bets and raises frequently. A passive opponent is a player who calls and checks often and very rarely bets or raises. Aggression is one of the keys to success in poker for one simple reason: When you bet or raise, you have two ways to win the pot – either your opponent folds or you get to showdown with the best hand. Unfortunately, when a player is passive there is only one way to win the pot – by having the best hand. This difference is hugely important and is the reason all big winners are aggressive poker players; while most losing poker players are quite passive. Preflop poker strategy Tip 3: Take the initiative and be aggressive. Bet and raise your strong hands frequently and don’t rely on other to do the betting for you! Tight-Aggressive (TAg) – This player type which makes up the majority of the winning player pool. They wait for strong hands and bet and raise them hard, punishing other players who play weaker styles. Loose-Aggressive (LAg) – successful loose aggressive players are few and far between. They play lots of hands and play them very aggressively. It is a tough style to play but also a tough style to combat! Tight-Passive – this player type does not play very many hands and when they do the play them by calling and checking frequently. These players lose their money slowly but surely. 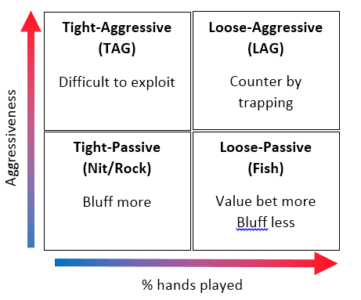 Loose-Passive – these player types just don’t like to fold. Loose passive players play lots of hands – sometimes over 50% of the hands they are dealt. They are the complete opposite of tight-aggressive. This player type is the biggest loser and where the big winners make their money. So what hands should you play? That is a difficult question to answer since it depends on many factors – what position you are in, how many opponents are on the table, how likely your opponents are to raise, the equity of your hand, how many BB you have and how many hands you have been raising recently. For more on loose aggressive and tight aggressive players, check out ship-itpoker.com. 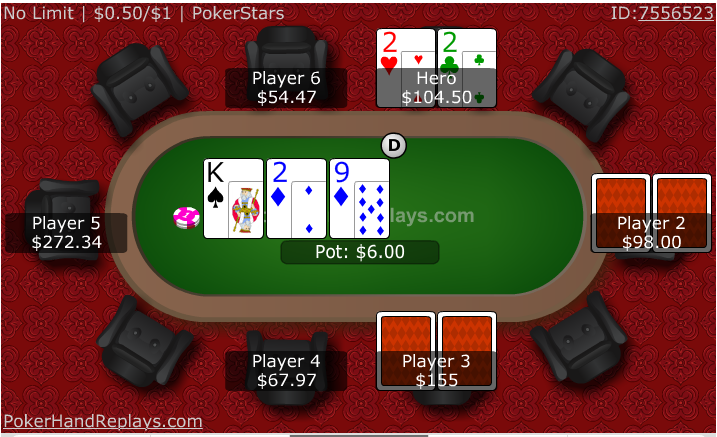 It blocks AA and KK which are the only two hands which have a significant equity advantage. These hand should always be raised and often re-raised to begin building the pot. AQ, AJ, AT, KQ and 99-TT. Large suited and connected hands such as QJs, JTs, are also considered strong hands. Suited hands derive their strength from being able to make flushes. However, do not overestimate the value of suited hands. Don’t play a hand just because it is suited. The value of a hand is derived from the combination of the ranks of the two hole cards. Example: AQ is much stronger than Q5, AQ is still much stronger than Q5 suited. Preflop poker strategy tip 4: Do not overestimate the value of ‘suitedness.’ Evaluate the strength of the hand from the rank of the two hole cards. KJ, KT, QJ, JT and 22-88. Medium suited connectors such as 87s are also considered to be medium strength hands. You will play different hands from various starting positions. Details on this require a separate section – for more on the differences in the positions read position is king which will provide a beginners starting hand chart. You should play a small percentage of the hands you are dealt. Take the initiative and be aggressive. Raise and Reraise your strong hands frequently and don’t rely on other to do the raising for you! Do not overestimate the value of ‘suitedness.’ Evaluate the strength of the hand from the rank of the two hole cards. If all you take from this section is these four points you will still have significantly improved your chances of winning. Once you understand right preflop Texas Holdem strategy, the postflop poker strategy becomes significantly easier. When you play weak hands from poor positions poker is quite difficult; nobody likes to play Q7 from out of position (Out of position means you act first, so your opponent will have more information than you)! However, if you play only a narrow range of hands from good starting positions, as is recommended, poker will become a much simpler prospect. Postflop, there are many factors which we must take into account before we make a decision. The number of variables makes each decision quite complicated for a beginner. However, there are a few guidelines and concepts which can be understood which will help you in the decision-making process. One of the most important considerations is if we are in position (IP) or out of position (OOP). We will cover this in more detail in Position is king. Secondly, we should be considering what our opponent may be holding. Does our opponent have only strong hands if he is a tight player? Does he play lots of hands meaning his ‘range’ of hands will be quite weak? See more on how to hand read. A whole book could be written on hand reading, so I won’t go further into it. But it is important as a new player to begin thinking about what your opponent may have. Do not only consider the hand you are holding. Postflop poker strategy Tip 1: Always consider what your opponent could be holding. Next, we should consider the board texture. For example, is the board likely to have improved your hand or your competitors? Is the board likely to change very much on the turn or river? These considerations will be detailed further on in this guide. Another consideration is how many players made it to the flop. If the flop is heads up (only you and your opponent) the strength of each hand is much better than if five or even six people made it to the flop. The more players that see the flop, turn, and river the less likely you are to win at showdown with a weak holding such as one pair. For more information on the differences between multiway and heads up pots, head over to pokernews.com. Postflop poker strategy Tip 2: The more players there are in the hand, the less likely you are to win and the weaker your holding. Finally, we need to consider how many chips are in the pot, how much we have left behind in our stack and how many chips our opponent has. After these considerations, we can make a decision on how we are going proceed in the hand. Before we discuss postflop poker strategy and board composition in detail we need to make sure the notation is clear to everyone. This texture is described by 5♥ K♣ 5♦ and is often shortened to 5hKc5d. It is sometimes shortened further to 5K5r. Here the ‘r’ means rainbow (the flop is all different suits). When the flop has a flush draw (i.e. not a rainbow board) the board could be represented by 5K5s. Here the ‘s’ represents suited. There are many types of boards, but in general, they can be broken down into two types: dry board textures and wet board textures. Dry board textures are ones which the players in the hand are less likely to have connected with the community cards. Also, dry also means a board which the strength of your holding is unlikely to change over the course of the hand. An Ax (e.g. Ace-Queen or Ace-Seven) hand and hits an ace on the turn or river. A pocket pair such as 77 which hits his set on the turn or river (unlikely). 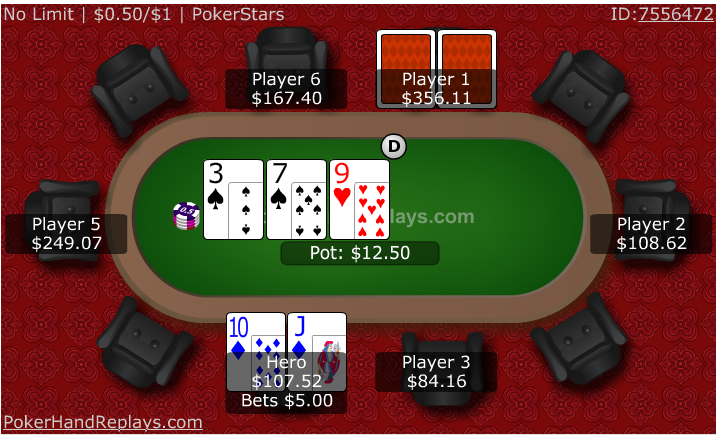 A hand such as QJ which hits a runner runner straight (two cards in a row – for example, the turn is a Ten, and the river is an Ace resulting a straight Ten to Ace) or runner runner full house (two Queens or two Jacks). The most important factor is that neither of these two board has many straight-draw or flush-draw possibilities. The lack of draws means that if you have a hand like A5 on the K55 board or 44 on the 742 board you are very unlikely to be beaten by your opponent if he is behind on the flop. Additionally, dry flops are inherently difficult to hit and hence makes continuation betting as the pre-flop raiser (you raised first, and someone called your raise) especially useful on dry boards. Continuations bets will be detailed further on in this section. On the other hand, wet board textures are boards where the board is very likely to change over future streets. Any 8 or K is an inside straight draw (4 cards will complete the straight). The majority of opponents plays Queens, Tens, and Nines. Therefore, your opponent is likely to continue with a large proportion of his hands on this board. We can directly translate all these points to the 432s board; except for the last as this board has cards of lower ranks. On the 432s board, however, every Ace has an inside straight draw. Aces will be played quite frequently by most opponents. Every other board type will be somewhere in between the dry K55r and the wet QT9s. Understanding how wet or dry a board is and adjusting your strategy correctly is the key skill at play in this scenario. For more information on board textures, see this excellent article. The player who last raised pre-flop will typically have the strongest hands; thus will get the benefit of the doubt when he bets again. The rate at which you continuation bet should, be on a very basic level, determined by the wetness of the board. The dryer the board, the less likely your opponent hit and therefore the more often we will want to bet to win the pot. But we should also be more prone to bet when we have a chance to win the pot when called. In other words, we have pot equity in the form of a draw or overcards. Postflop poker strategy Tip 3: The dryer a board texture, the more likely we are to win the pot by continuation betting (cbet). We opened to 3bb from UTG and got one call from the Button. On the flop of 9h7s3s, we have an inside straight draw and two overcards. This board is ranked medium for wetness and how the opponent connects; our opponent can have a few straight and flush draws as well as top pairs. JTs is a good hand in this situation as we can make robust pairs on the turn and river and also can make the nut straight. Thus this is a good spot for a cbet as a bluff. We expect him to fold hands which are better than ours. However, if he does continue, we have a good chance of making a stronger hand with a J, T or 8. We should keep bluffing to a minimum when playing small stakes and especially at play money poker. But in this case, it is almost a perfect situation for a bluff. We raised with 22 from the Button and got two callers from the SB and BB. Both check to us on the flop. This situation is a clear spot to value bet (value betting and bluffing are discussed in the next section). The flop is relatively wet, and two players can draw out us with straights and flush draws. Therefore, we want to charge them to see them next card. Also, we have a robust hand (the second or third strongest depending on whether our opponents will re-raise KK preflop). We can get lots of value and win a big pot by betting; thus this is an excellent spot for a value bet. Cbetting for value is a fundamental aspect of our postflop poker strategy and is one of the primary sources of profit at small stakes. Ensure you understand and utilize continuation betting fully by reading our in-depth article. We raise a limper with 98s and get a call from the BB and the player who limped. The flop is terrible for us as we have a small amount of equity and this board is likely to have hit one of our opponents. Thus it is not a good spot to continuation bet (cbet), and we should check behind and fold to any future bets. Continuation bets can also apply to the turn and the river. For example, we refer to betting the flop, turn and river as river continuation bet. Continuation bets are how a significant proportion of your winnings will be generated at small stakes and free money poker. People often give up when they do not hit anything so take advantage of this fact. If you are playing ‘short stack’ poker, it means you are not playing with very many chips on the table – for example, 40bb. We do not recommend shallow stack play. Shallow stack poker means we have fewer chips on the table and hence we can win fewer chips from the weak poker players at the table. Conversely deep stacked play means you have a lot of chips at the table – e.g. 200bb deep. Stack depth has a profound effect on your preflop and postflop poker strategy so ensure you are aware of your stack depth at all times. For example, it would be appropriate to allow yourself to get all in with post flop with top pair good kicker such as KQ on K72 if you had a stack depth of 40bb; however, not if you had a stack depth of 100bb or greater. Postflop poker strategy tip 5: The greater your stack depth, the stronger a holding you need to stack off. Always be aware of your stack depth before entering a pot. Before playing a hand preflop, you should be checking the stack depth of you and your opponents. Checking stack depth ensures you understand how many chips are at play. One mistake often made by new players is not considering effective stack size: if you have 100bb and your opponents has 40bb then the effective stack size is 40bb; this is because your opponent can win no more than 40bb from you. Hence your effective stack size can vary from hand to hand, and you must adjust you postflop poker strategy accordingly. Betting is the fundamental aspect of poker which makes it an exciting game to play. The ability to wager money as a bluff inducing your opponent to fold is one of the biggest selling points of the game; it is the first thing people think of when discussing poker! But it’s not all about bluffing as Hollywood has led you to believe. A lot of a winning Texas Holdem strategy just involves getting your bets in when you have a better hand than your opponent. For value – to get worse hands to call meaning we will win a bigger pot. 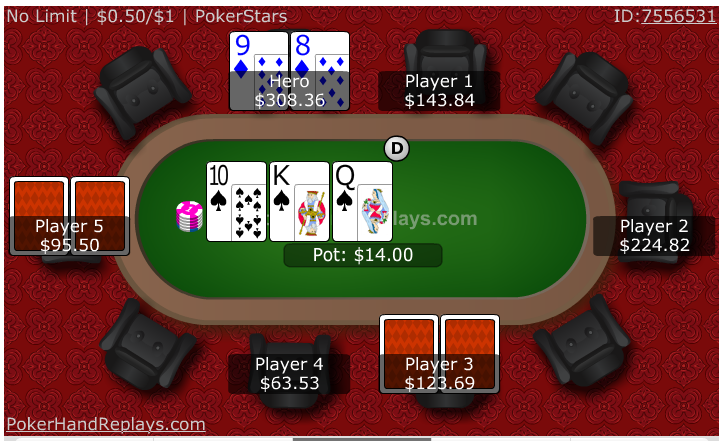 For example, you value bet AK on an Ace high board (such as A72) to get AQ, AJ, etc. and worse pairs to call. As a bluff – to get better hands to fold so we can win the pot with a poor holding. For example, you may be QJ on the A72 board to get hands such as non-paired Kings (KQ, KJ) to fold. As a semi-bluff – A semi-bluff is much like a natural bluff only that when we are called we will still have a good likelihood of winning the pot. With a semi-bluff, we have a lot of pot equity. 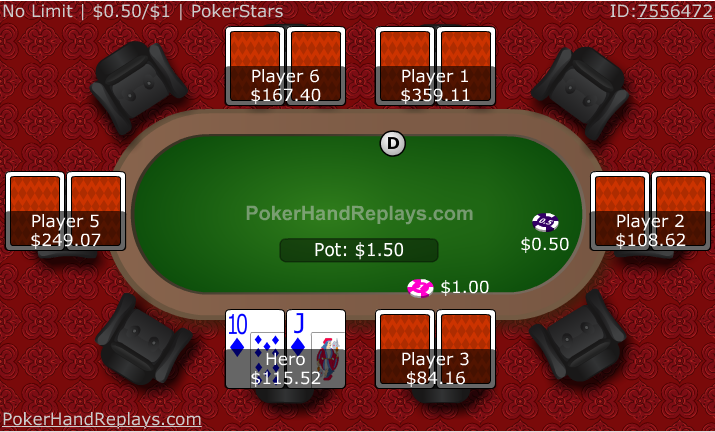 An example of a semi-bluff would be betting or raising with a flush draw: a weak non-made hand which has the potential to make a robust hand. See more information on semi-bluffing. Before betting, consideration should be made as to why a bet is being made. Can worse hands call our bet and provide us with value? Can we get better hands to fold? If neither is the case, you typically shouldn’t be betting. This concept is integral to correctly implementing a solid poker betting strategy. Poker Betting Strategy Tip 1: Always consider when betting, will your bet either get your opponent to fold a better hand (bluffing) or call with a worse hand (value betting). This concept can difficult to grasp as a new player. But generally, you should be just betting with your strong hands; and if you are playing small stakes or especially free poker, keep bluffing to a minimum. People at low stakes or even play money poker do not fold; thus bluffing at these stakes is a complete waste of money. 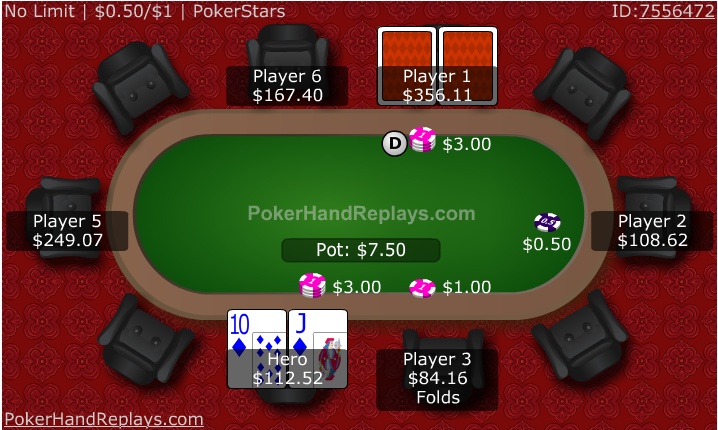 Preflop raise to 3 times (3x) the BB with all hands you are opening. Do not varying your bet sizing depending on your hand strength. Changing your bet sizing based on your hand strength is a sure fire way to let your skilled opponents what you are holding. The same applies when re-raising another player preflop, make your raise three times the initial raise. For example, a player in a 100Nl game might open to $3. In that case, when you re-raise him with your strong holdings such as AA or KK, make it $9. Postflop bet between 1/2 and full pot size bets. That means that if on the flop, the pot is $10 you should be betting between $5 and $10. Any smaller than that and your opponent can easily call with a lot of hands. Allowing your opponent to call with lots of hands means you miss value with strong hands; also, your opponent isn’t likely to fold when you are bluffing. This is a bad result either way! A big mistake new players often make is using the same bet size as the pot grows on each street. For example: betting 5$ into a $10 pot on the flop and then betting $5 into a $20 pot on the turn. Your bet sizes should be relative to the pot! As the pot grows so should the size of your bet. Think fractions, not dollar amounts! Poker Betting Strategy 2: As a general rule always raise at least three times the previous bet or raise. When betting postflop bet between 1/2 to a full pot sized bet. These bet sizing rules aren’t optimal; they are approximations. However, they should provide you with solid groundwork to get you off to a good start in your poker career. Once you begin to understand the merits of betting and raising and develop a more comprehensive poker betting strategy you can start to see when it is appropriate to deviate from these rules. See this video on value betting for more information. That’s it for Texas Holdem Strategy. If you are really keen on learning poker quickly, we would suggest you check out our poker training sites post to accelerate your poker learning. Check out position is king to learn more about position! Or return to poker 101?